I started today's walk at the parking lot near the Brisbane fishing pier. Today I spotted even more ground squirrels -- feeding, sitting in the sun, and dashing around -- than yesterday (on the strips of lawn around the fishing pier). From the pier area, I walked West on the paved trail, as far as I could go before an arrow directed me back toward the Sing Tao Beer building, where there was a paved trail heading South. I saw (in the middle of the current economic downturn and lots of commercial for lease signs) full parking lots at Sing Tao and Walmart.com. I walked South until I hit a point near the Bay (near intersection of red and yellow lines on the map shown), where I'd been walking a few days ago. I then went North and then West (under Highway 101) then Northish along Brisbane Lagoon, on Sierra Pt. Parkway. 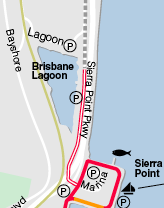 (See Bay Trail map image above.) The map indicated, with broken red lines, this trail segment by the Lagoon was along paved roads (bike lanes); and, true enough, car and truck traffic whizzed by me at high speeds. (Note: Use caution when crossing the freeway off- and/or on-ramps, where Marina approaches the Highway 101 underpass. Highway 101 is shown as a thick white line on map.) In another example of urban coexistence, you also may get treated to a few trains going by, which I enjoyed. However, if you're staying at one of the nearby hotels it may not be so fun. Along the Brisbane Lagoon, there is a small area for fishing with a few parking spaces. It was also a reasonably good bird watching area. There were a few pelicans crash-diving into the water, lots of ducks lolling about, and at least one egret. Several small birds were perched in the wild anise/fennel bushes. The rest of this area is marked private property. There are limited areas to stop or park if you're in a car. I walked a little past the end of the Lagoon (toward the Highway 101 South on-ramp) before turning around and heading back. 11 ground squirrels; 110 ducks; 10 Western grebes; 57 little brown jobs (LBJs); 3 sea gulls; 1 great egret; 3 coots; 1 grayish blur in grass (fat lizard? ); 1 feral cat near freeway; 3 pigeons; 3 brown pelicans; 1 snowy egret.